Argentina striker Lionel Messi will face Portugal forward Cristiano Ronaldo in England for the first time since 2008 on Tuesday, with both laying claim to be the world's greatest player. 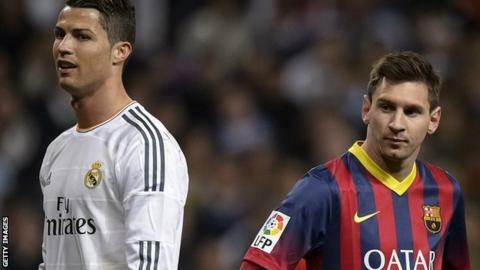 The pair are on the 23-man shortlist for the 2014 Fifa Ballon d'Or, awarded to the best player in world football. Ronaldo has been described as "almost perfect" by team-mate Ricardo Carvalho ahead of the Old Trafford showdown. But Argentina coach Gerardo Martino says his heart "lies with Messi". The two forwards are the only players to have been named the world's top male player in the last six years, with Ronaldo winning the award in 2008 and 2013, and Messi receiving the honour in 2009, 2010, 2011 and 2012. Messi also won the Golden Ball after being named player of the tournament at the 2014 World Cup in Brazil, where Argentina finished runners-up. Both players had their case for winning the Ballon d'Or put forward by international colleagues at news conferences on Monday. Portugal defender Carvalho, who spent three years playing alongside Ronaldo at Real Madrid, said of the 29-year-old: "When you see him, he is almost perfect." The Monaco centre-back added. "He is strong, good in the air, fit always. It is difficult to say what he is missing. He wants always more and more, even in training. "I am a little bit biased, but I think he is the best. All of us expect him to win the Ballon d'Or. We are so proud of him." But Argentina coach Martino said he would vote for 27-year-old Messi, whom he also coached at Barcelona for a season before leaving in May. Martino said: "You can't take out of the deciding process the fact that I am Argentinian, and my heart lies with Messi. "I am not the best person to judge. I cannot separate sentiment from my objective decision. Whatever season Messi has had on footballing grounds, I would still vote for him." The pair played at Old Trafford when they last met in England. Ronaldo - scorer of 18 goals in 10 league games for Real Madrid this season - was part of a Manchester United side who beat Messi's Barcelona 1-0 in a Champions League semi-final second leg for a 2-1 aggregate victory before going on to defeat Chelsea in the final. Juventus forward Carlos Tevez, who was a team-mate of Ronaldo in that United side, will also return to Old Trafford as part of the Argentina squad. Martino's party includes current United winger Angel Di Maria, as well as four men who play for neighbours Manchester City - goalkeeper Willy Caballero, central defender Martin Demichelis, right-back Pablo Zabaleta and striker Sergio Aguero. The crowd is set to be well short of the ground's 75,635 capacity, although organisers are hoping for a crowd above 50,000. What next for 'genius' Lionel Messi? Read more on Lionel Messi: What will Barcelona playmaker achieve next?